Home » New Product » Acoustic » How can you buy a brand new acoustic piano for 130 dollars? Japan: Kawai have just remodelled their very successful P-32 range, and these are selling for just 13,800 yen (less than 130 USD). Too good to be true? Well “Yes” and “No”! 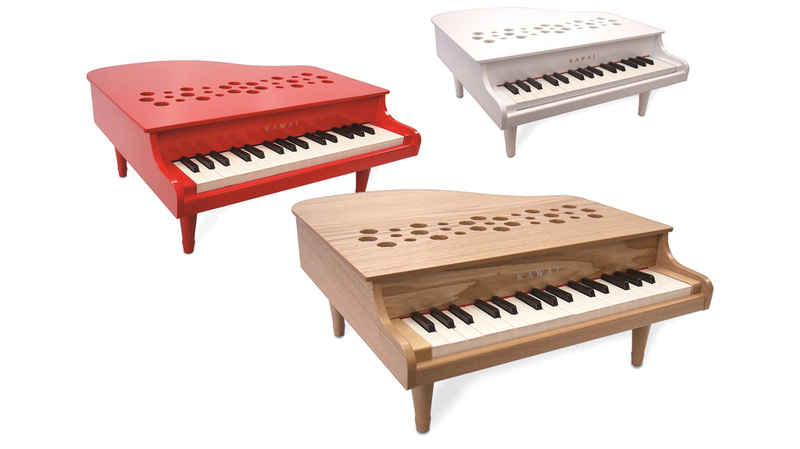 Okay, so if you didn’t already know, these are toy pianos. However, this instrument should not be dismissed out of hand. In fact it is probably the best ‘serious’ musical instrument you can give a younger child to encourage them to play the piano. 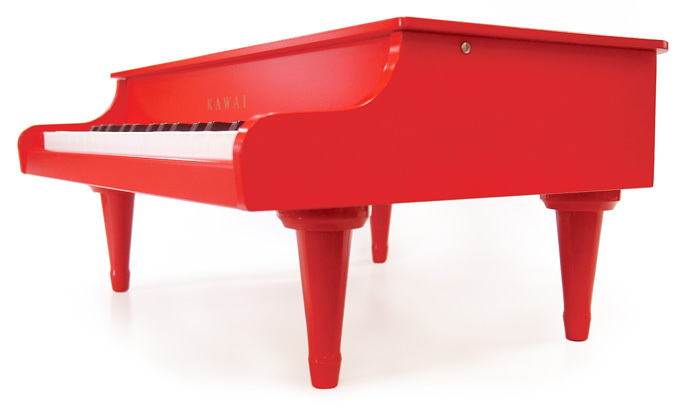 Kawai started making toy pianos in 1985. The newly updated Mini Piano P-32, has a fixed (closed) lid; a second version has a lifting lid, and a third is styled as an upright. The pianos are made of wood and have four legs, for extra strength and stability. Kawai have designed these instruments to be strong, really strong, capable of taking all the knocks a child can mete out. This is much more of a musical instrument than those cheap plastic toy pianos we had as kids. The 32 note keyboard action utilises small hammers to strike a series of tuned aluminium pipes. This upgraded action is more rugged than its predecessor. It now has a wider dynamic range such that even the youngest of children, with the lightest of touch, can trigger a sound. There is no amplification, nor batteries—this is purely a mechanical instrument. The keyboard of a traditional piano has a typical octave width of 164mm. Most mini (not micro) keyboards, found on some electronic instruments, use a keyboard with an octave span of 140mm. The Kawai P-32 has a span of around 133mm. The instrument’s dimensions are 425 (W) x 450 (D) x 185 (H, with legs), and it weighs 2.8 kg. This instrument, which is a kind of cross between a celesta and a dulcitone, is classified, I believe, as a struck idiophone. Not the most impressive sounding of classifications. Anyway the new P-32 is now available in Japan, and should start appearing in other territories later this year. Often you can find early imports on Amazon and eBay. This might make the perfect gift for a young nephew or niece this Christmas. More information can be found on Kawai’s Japanese website.